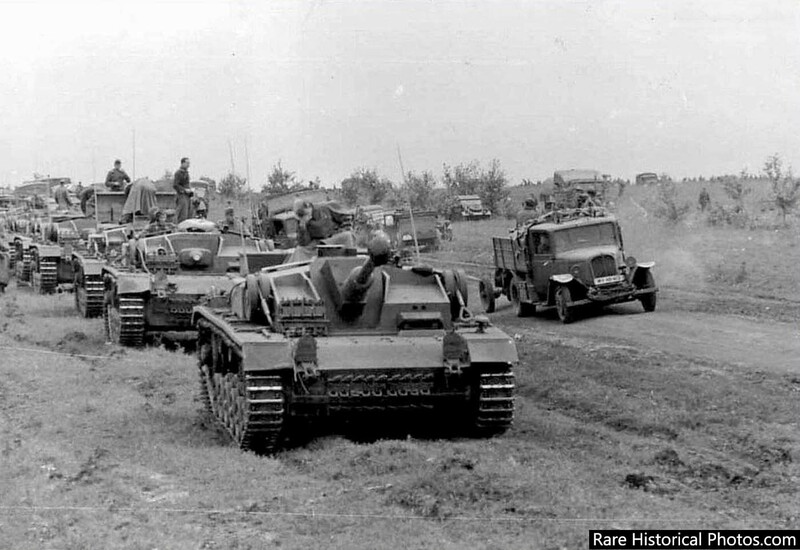 The German 24th Panzer Division moving towards Stalingrad. August, 1942. 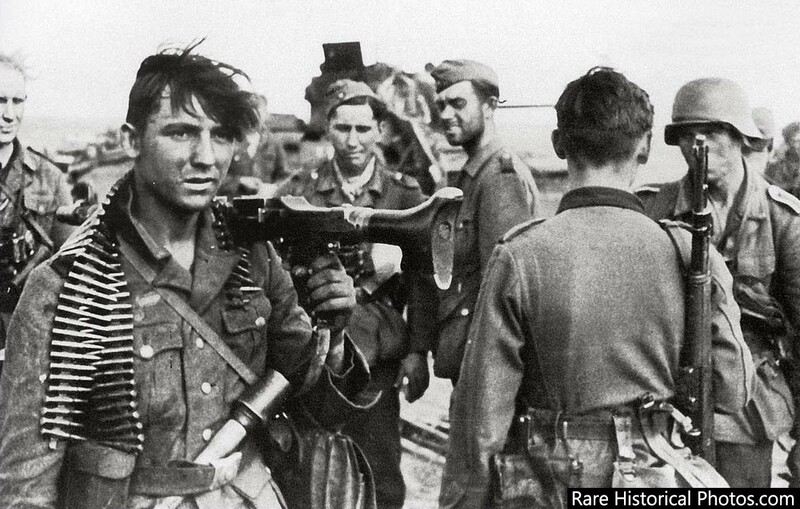 In June 1941 Hitler ordered a surprise invasion of the Soviet Union, and for most of the next year the German army routed the Soviet troops, capturing thousands of square kilometers of their country in the process. In August 1942 the German VI Army had pushed all the way to the banks of the Volga River, near the industrial heartland of the USSR. 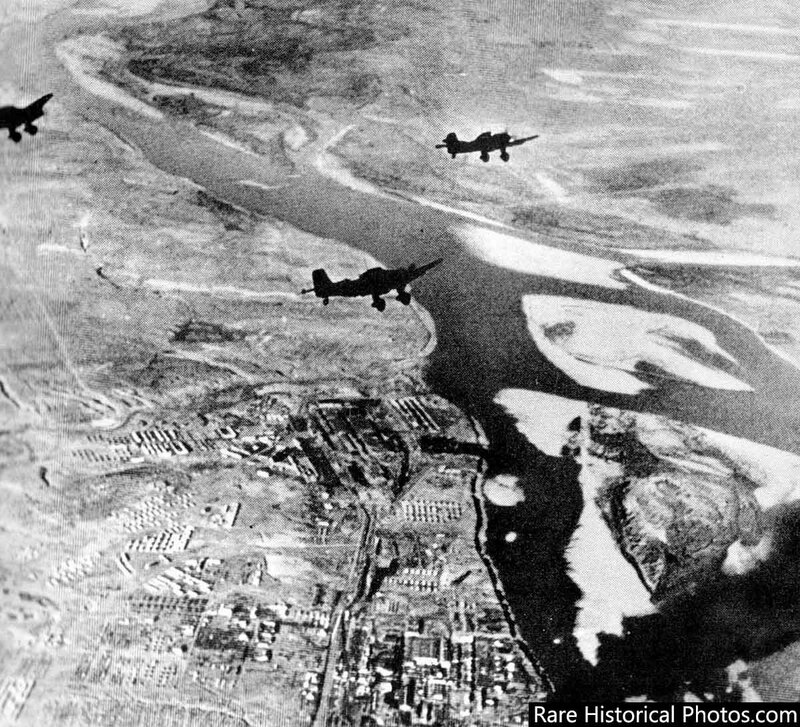 Once captured, the Nazis could sever the Volga, and potentially destroy Moscow’s ability to continue fighting. All they had to do was take one more city. Stalingrad. 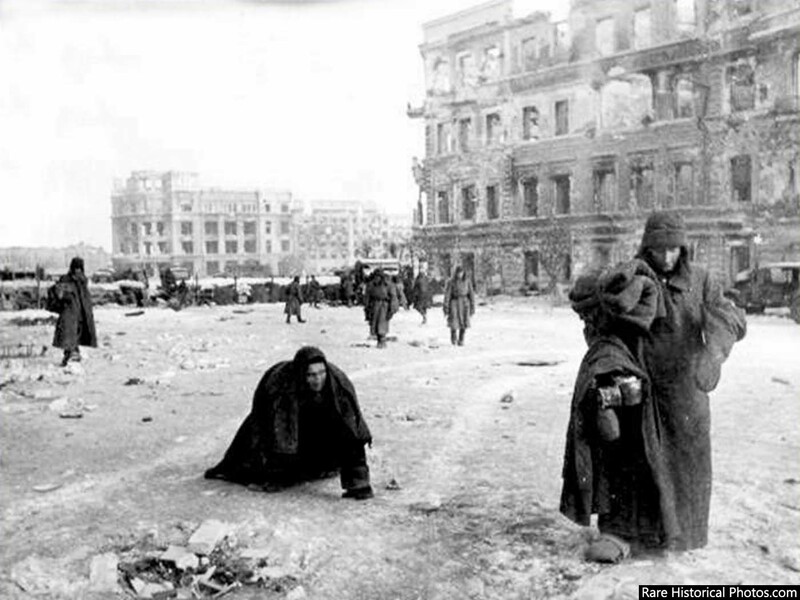 The prewar population of Stalingrad was four hundred thousand. It was home to a key river port as well as numerous important war and civilian industries. Because the city bore the name of the leader of the USSR, Joseph Stalin, Hitler took particular interest in capturing the city as a personal hit on the Soviet leader. Stalin likewise placed great importance on holding the city to prevent Hitler from capturing the city carrying his name. 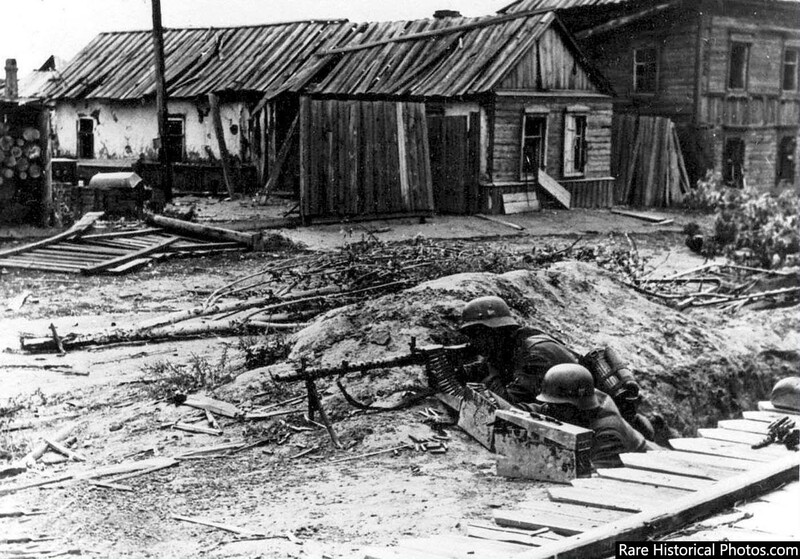 Though Stalingrad carried significant military importance, the psychological importance both leaders placed on the city elevated it to a level of importance above perhaps even the capital city of Moscow. The price both armies were willing to pay to possess it transcended military utility and entered fully into the category of obsession. German tanks approach Stalingrad. August, 1942. Initially the Germans made substantial and rapid progress in conquering the city. They attacked the city and its defenders with almost uncontested bombardment from the sky, tanks, artillery, mortars and other heavy weapons. 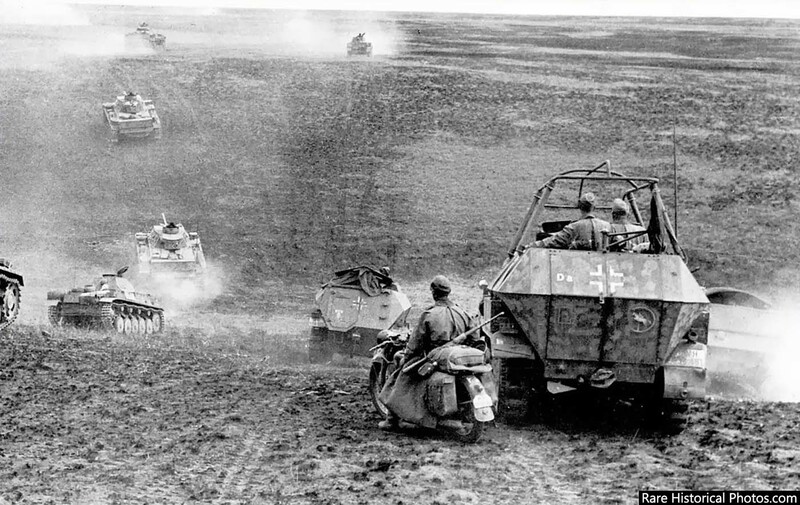 By early September 1942 the Germans were still making progress, but the rate of advance had slowed considerably. As a result of the enormous bombardment, the city and its buildings had been pulverized into one giant heap of rubble. The Russians began to develop defensive tactics that took advantage of the wrecked buildings, which ironically gave them advantages. Nevertheless, by November the relentless German assault had pushed the Soviet line almost all the way to the Volga River. Both sides had endured hundreds of thousands of casualties at this point, and the barbarity of the fighting on both sides of the line had transcended all bounds of human behavior. Right and wrong, morality, and honor among combatants had ceased to exist. The battle had literally descended into an animalistic struggle to survive. The turning point of the battle came with a huge Soviet counteroffensive, code-named Operation Uranus (November 19–23), which had been planned by Generals Georgy Konstantinovich Zhukov, Aleksandr Mikhailovich Vasilevsky, and Nikolay Nikolayevich Voronov. It was launched in two spearheads, some 50 miles (80 km) north and south of the German salient whose tip was at Stalingrad. 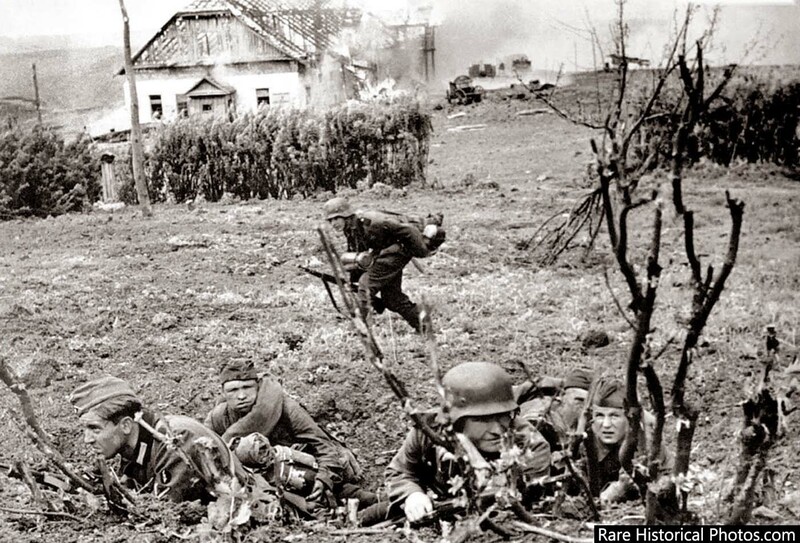 The counteroffensive utterly surprised the Germans, who thought the Soviets incapable of mounting such an attack. The operation was a “deep penetration” maneuver, attacking not the main German force at the forefront of the battle for Stalingrad—but instead hitting the weaker flanks. Those flanks were vulnerably exposed on the open steppes surrounding the city and were weakly defended by undermanned, undersupplied, overstretched, and undermotivated Romanian, Hungarian, and Italian troops. The attacks quickly penetrated deep into the flanks, and by November 23 the two prongs of the attack had linked up at Kalach, about 60 miles (100 km) west of Stalingrad; the encirclement of the two German armies in Stalingrad was complete. 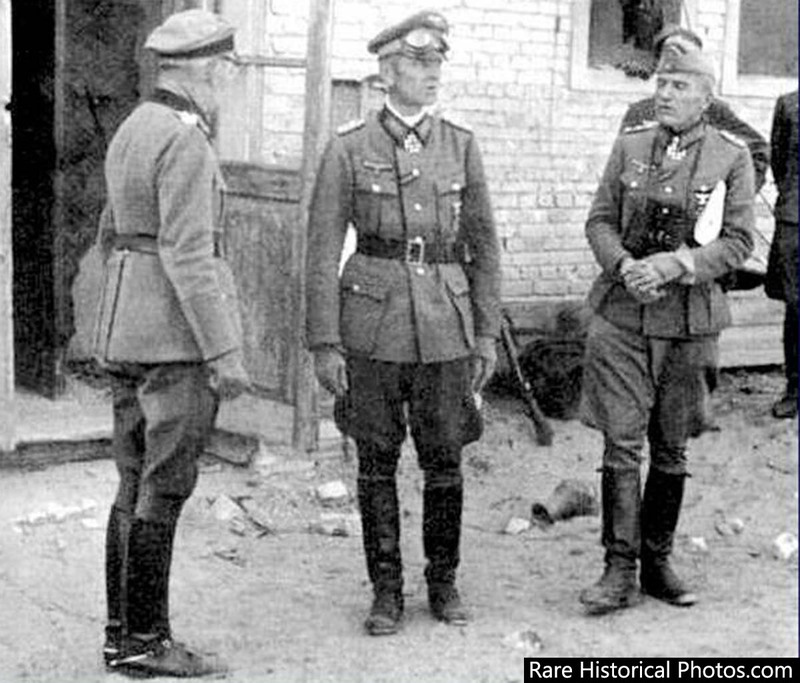 The German high command urged Hitler to allow Paulus and his forces to break out of the encirclement and rejoin the main German forces west of the city, but Hitler would not contemplate a retreat from the Volga River and ordered Paulus to “stand and fight”. 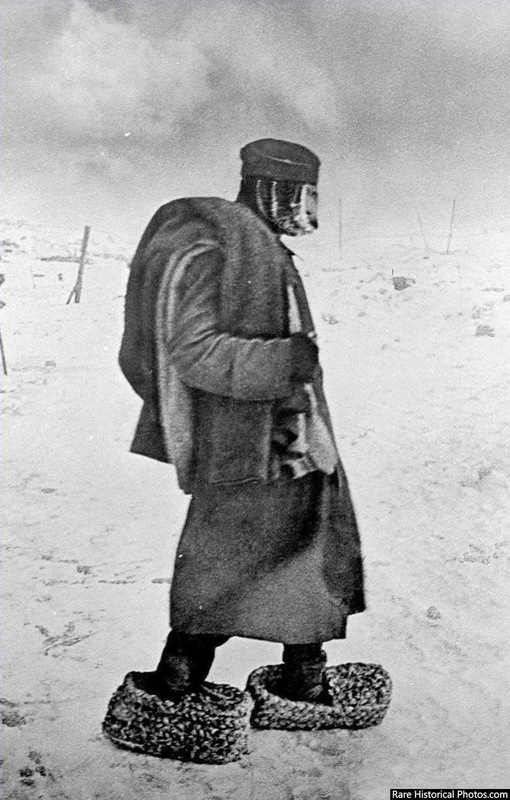 With winter setting in and food and medical supplies dwindling, Paulus’s forces grew weaker. 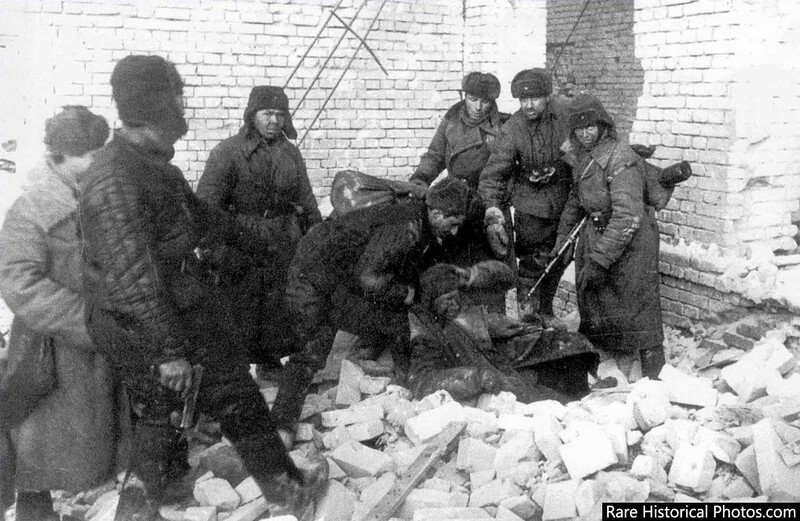 The carnage of the Battle of Stalingrad finally came to an end in February 1943, when the German Sixth Army Commander, Gen. Friedrich Paulus, surrendered the remaining ninety thousand troops of his army to the Soviet Forces. In June 1942, Nazi Germany was looking forward to victory. Six months and a million casualties later, the Reich had barely averted catastrophe. 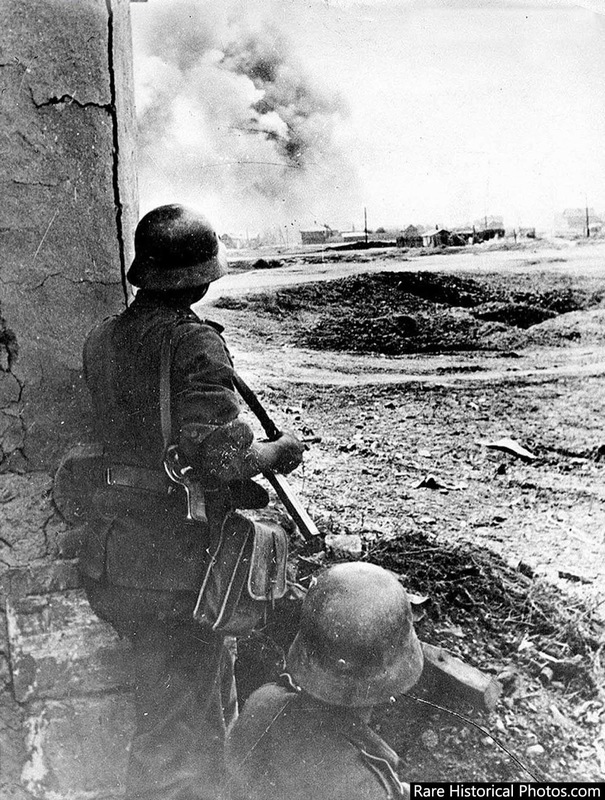 German soldiers on the outskirts of Stalingrad. 1942. 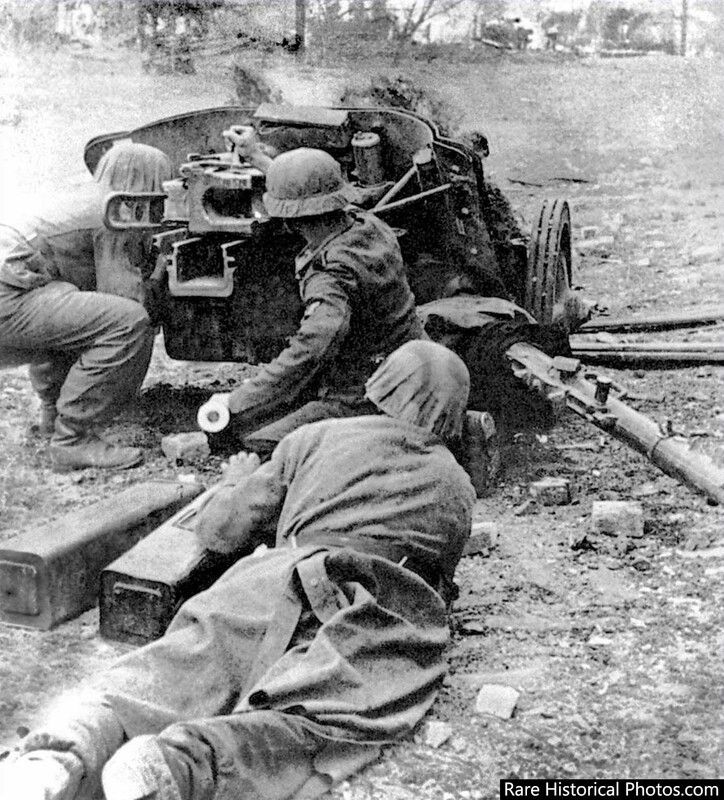 German soldiers at Stalingrad fire a 5 cm Pak 38 anti-tank gun. 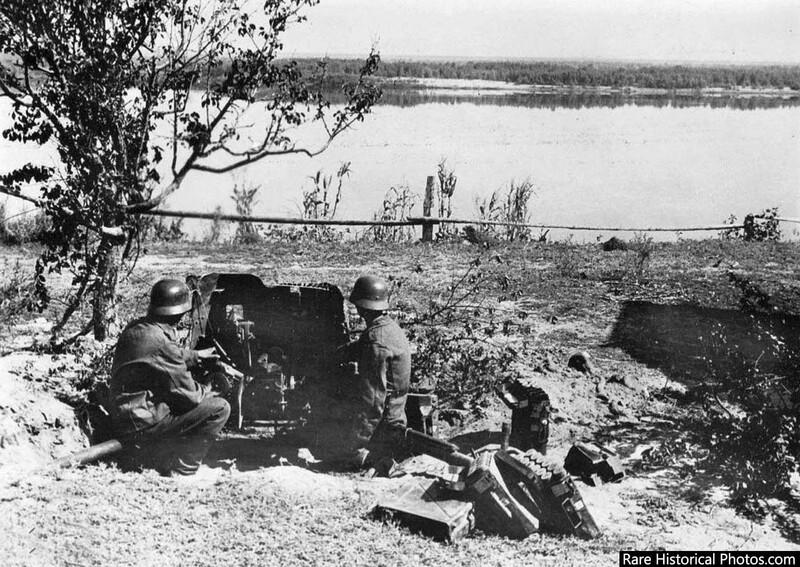 Germans with an anti-aircraft gun on the banks of the river Volga. September, 1942. Commander of the 6th Army Genral Paulus with General Moritz von Drebber of the 297th Infantry division. October 1942. Paulus’ trouble were yet to begun. 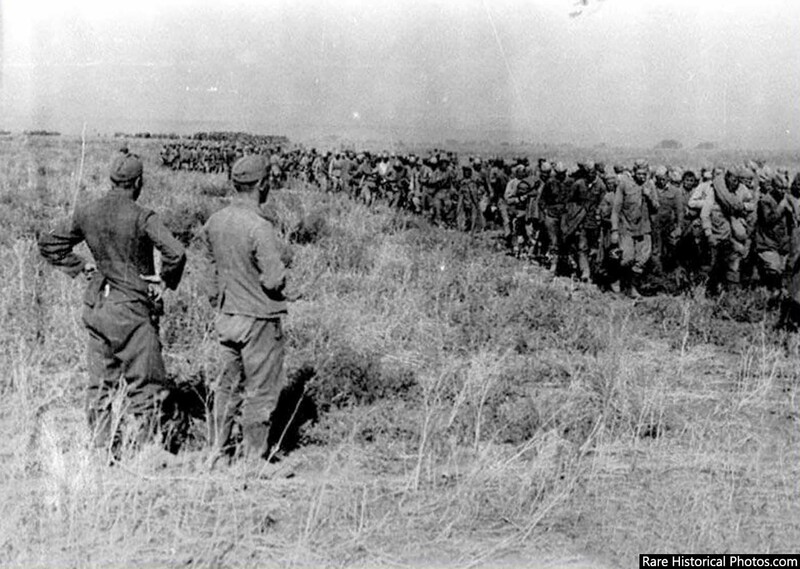 Two German soldiers look on curiously as captured Soviet soldiers file past. Stalingrad. September, 1942. German soldiers in a trench with a MG 34 machine gun. October 1942. 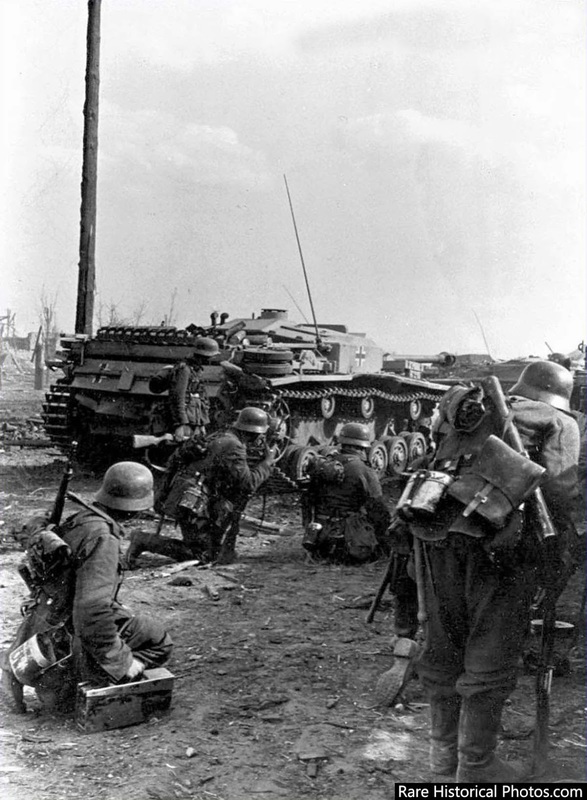 Germans prepare to attack in the outskirts of Stalingrad; taking cover behind a Stug 3. 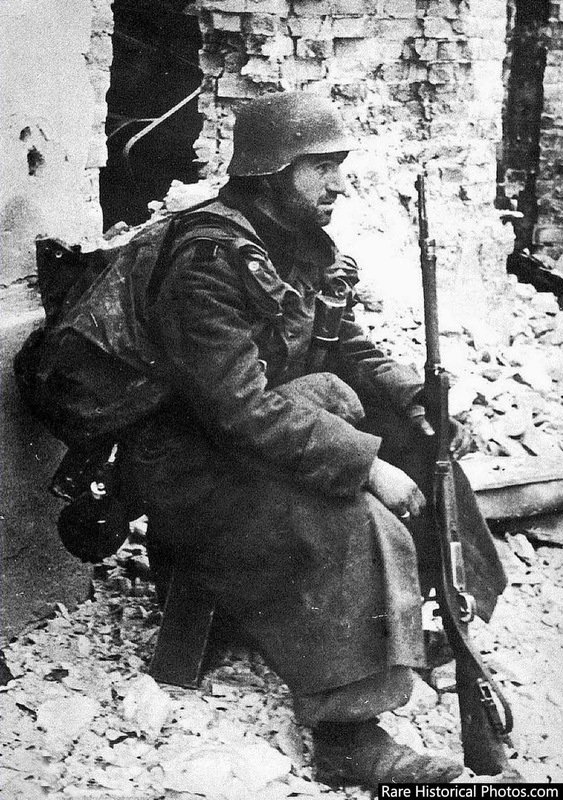 A German soldier rests at Stalingrad. 1942. Germans fire the 105 mm howitzer leFH 18 in the area of the grain elevator. September 1942. 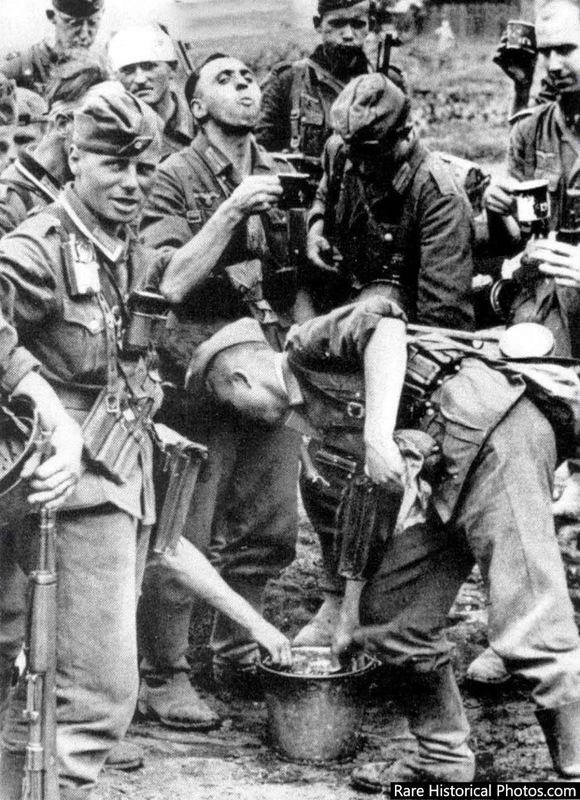 German soldiers and officers drink water at Stalingrad. This was before the tide turned. Look at the confidence and aggression on the face of the soldiers. 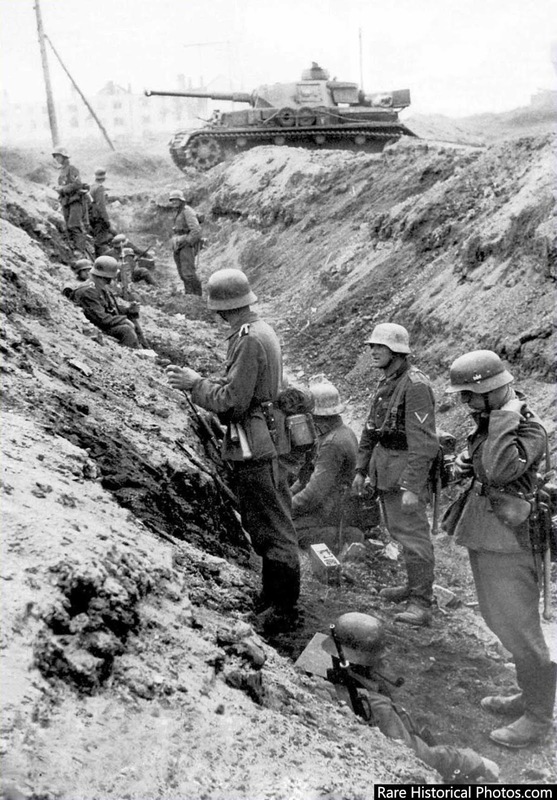 German soldiers waiting for orders to attack. 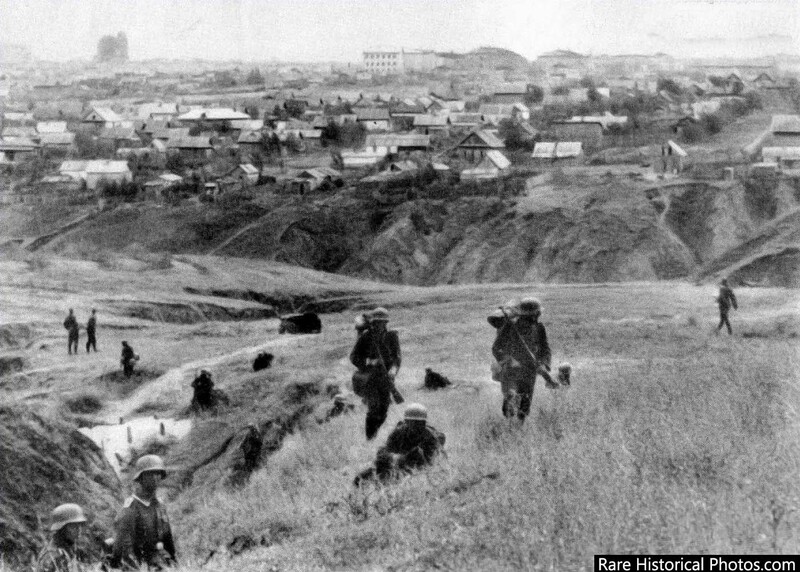 Outskirts of Stalingrad. Germans taking cover. 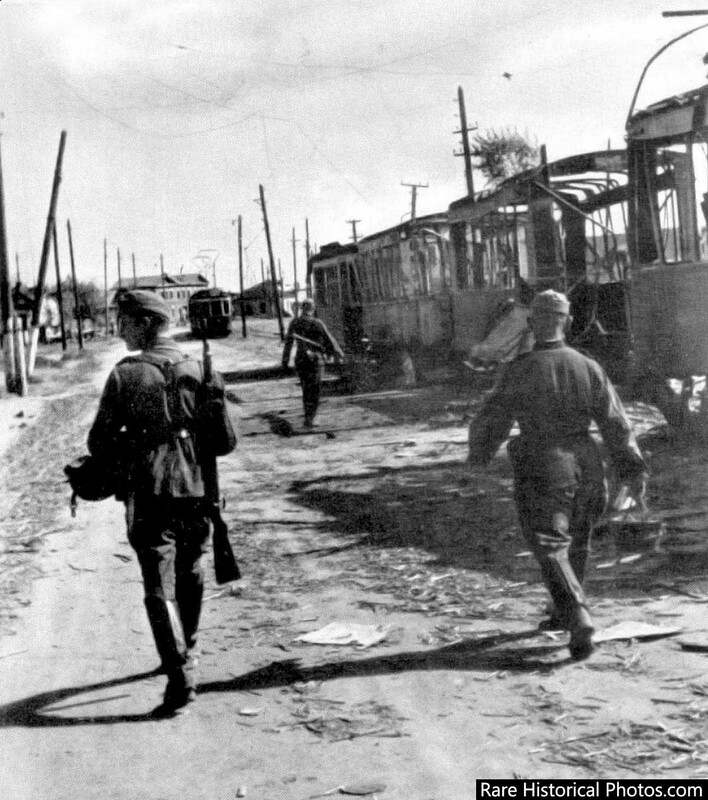 Germans walk past burnt tram cars on the streets of Stalingrad. 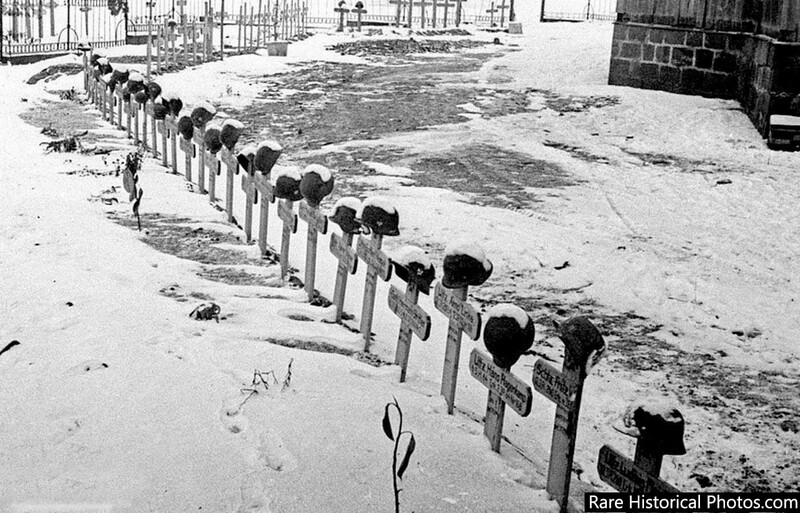 The Germans interred at Stalingrad. 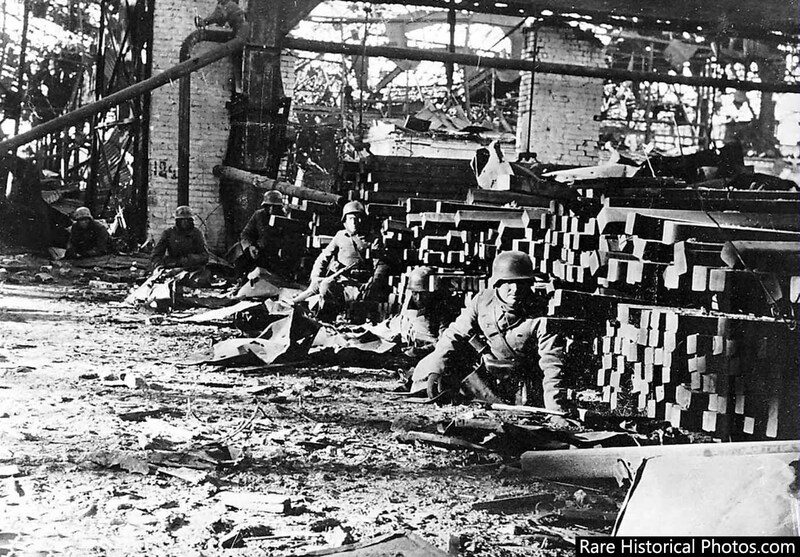 German infantrymen at the Red October factory. Hauptmann Friedrich Winkler at Stalingrad. He was one of the 91,000 German soldiers who surrendered in 1943. He later died at the POW camp at Beketovka. A German soldier cleans his rifle in a break between fighting. Autumn 1942. 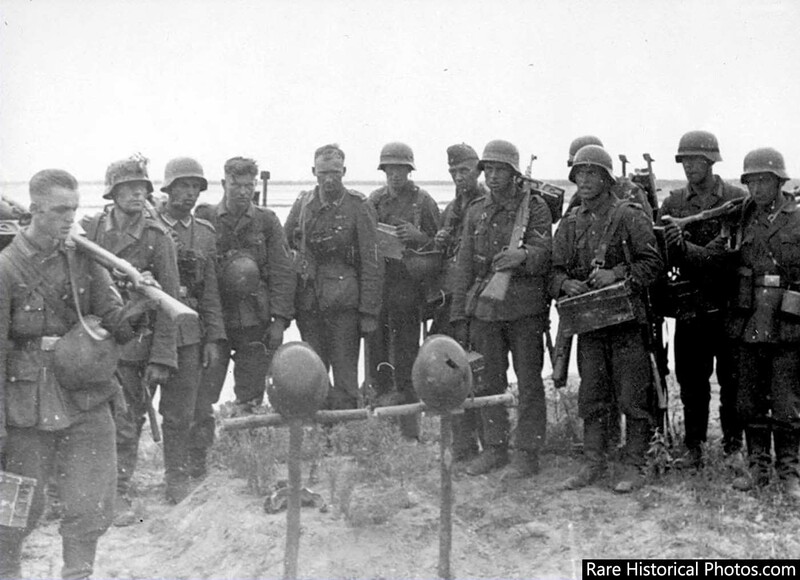 German soldiers at the graves of their fallen comrades at Stalingrad. 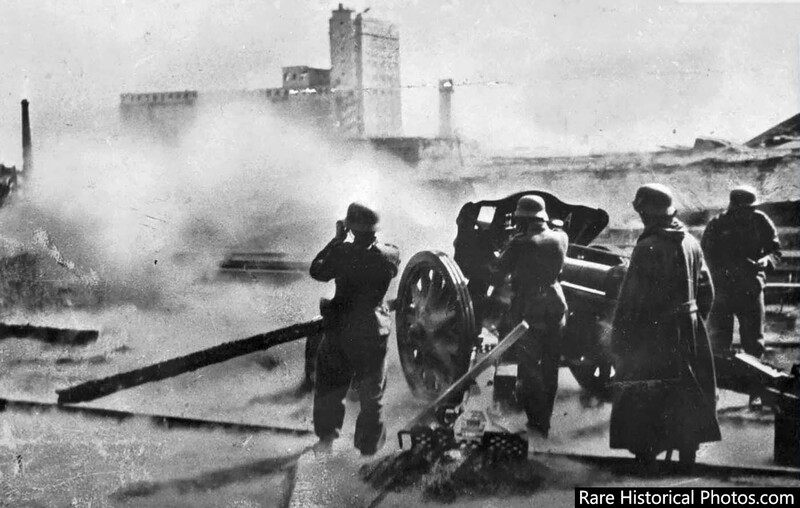 German soldiers watch as German guns pond Stalingrad. 1942. German Stuka Dive bombers about to bomb Stalingrad. 1942. A city too far. 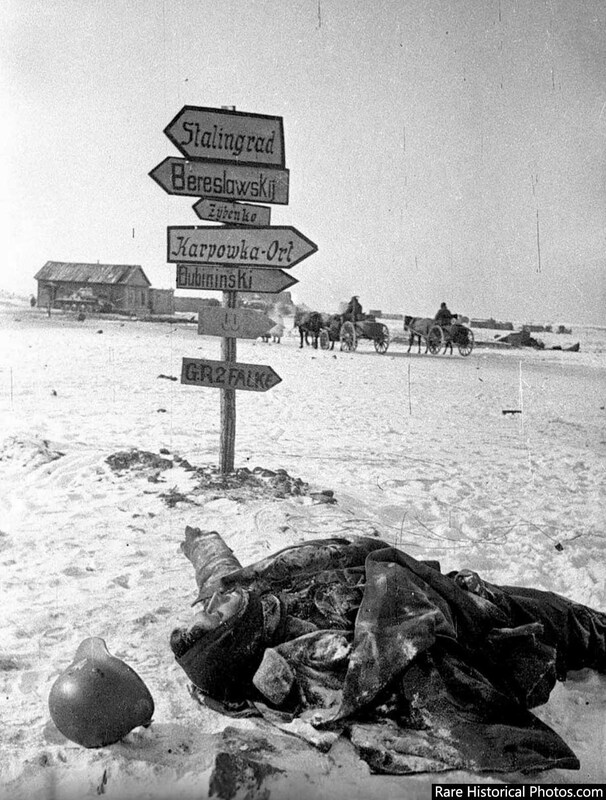 Dead German soldier near Stalingrad. 1943. 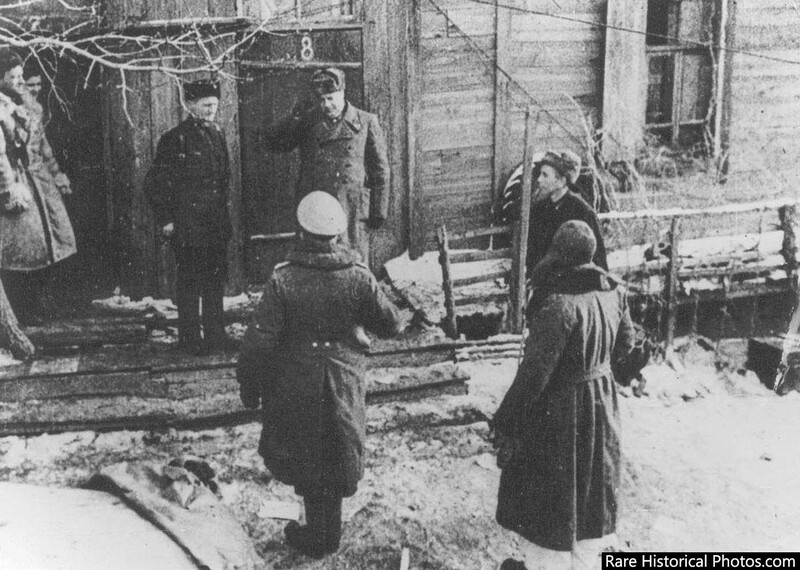 General Karl Strecker of the German Sixth Army surrenders to the Russians. February 2, 1943. 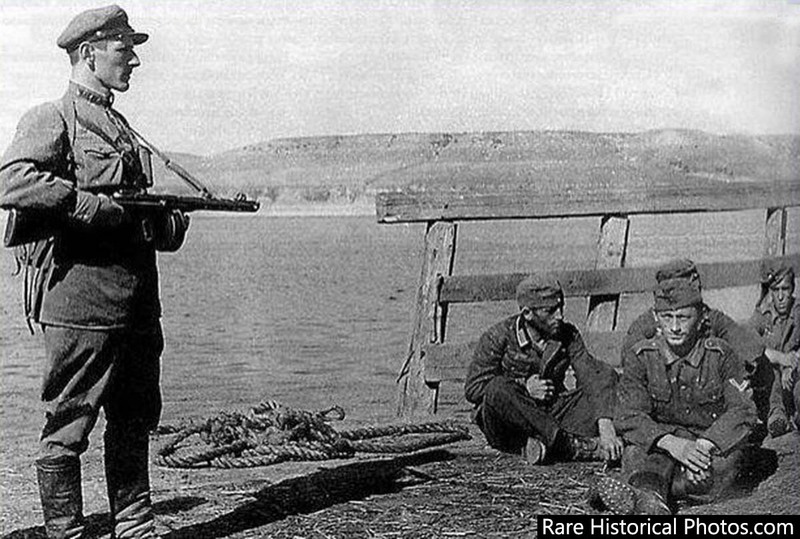 Captured German soldiers under a Red Army guard on the Volga. 1942. Captured German soldiers in a pathetic state at Stalingrad. 1943. 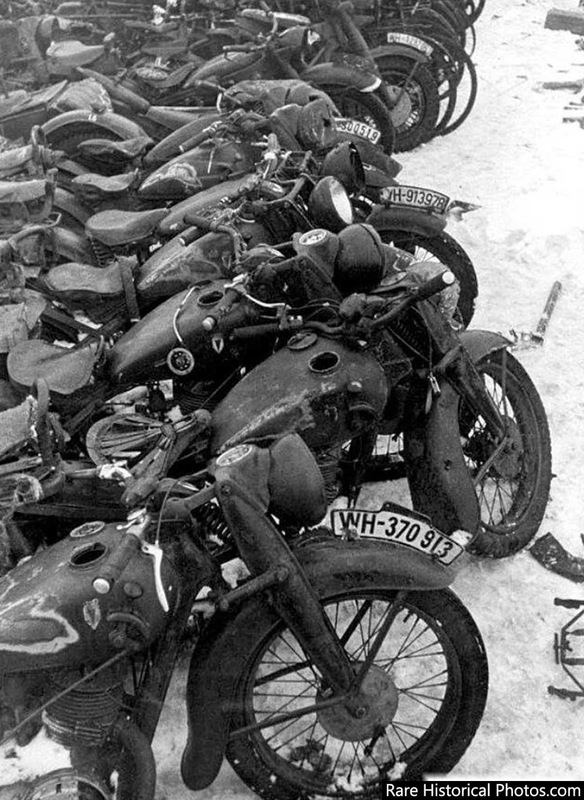 Captured German motorcycles at Stalingrad. 1943. 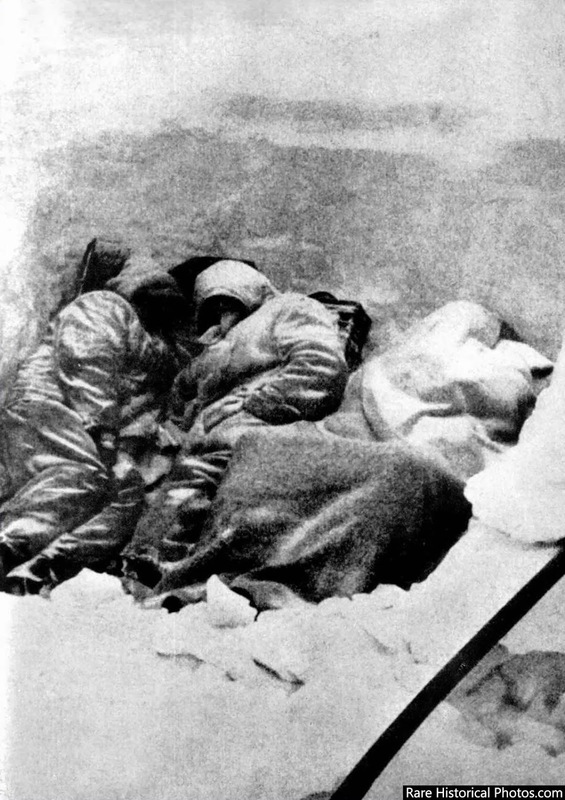 Dead frozen German soldiers in a trench at Stalingrad. February 1943. 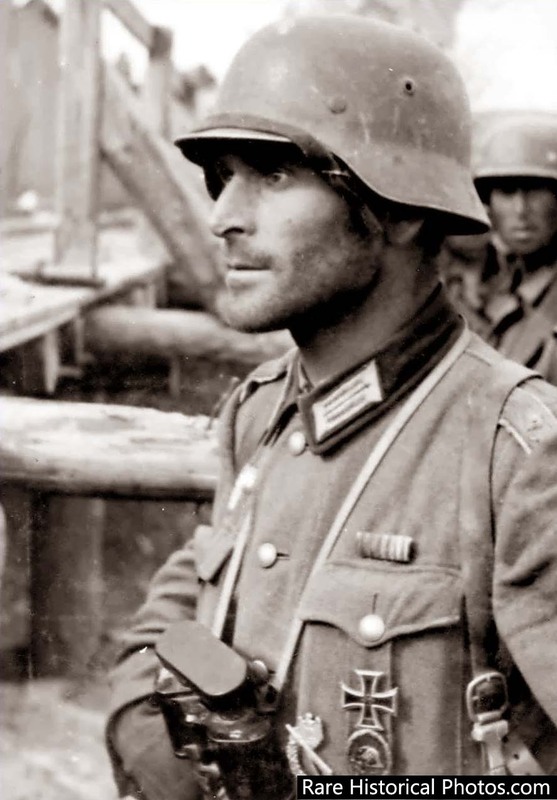 A captured German soldier. The desperate Germans had improvised to survive. A German sniper captured by Red Army men. The end of Hitler’s dream. 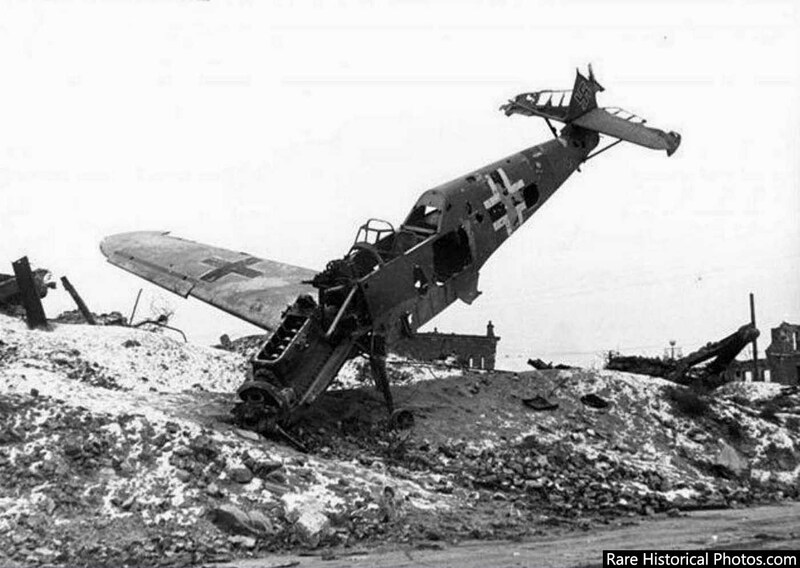 A downed German plane in Stalingrad. (Photo credit: German and Soviet Archives. Text: Dennis Showalter / Daniel L. Davis). Thanks for the superb images. 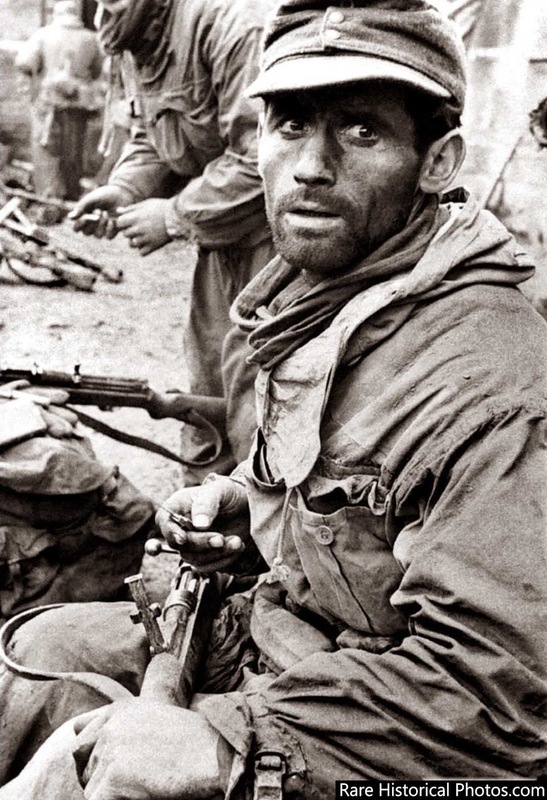 You constantly show me images I've never seen before, many with a candid feel, showing the real war. Picture 13, "Look at the confidence and aggression on the face of the soldiers." Yes, brought about by an endless supply of crystal methenamine. My grandfather was in the Wehrmacht and sent to Stalingrad in 1942, his obituary posted in Austria in 1946 said he was last seen in February 1943, I can only assume he met his fate as these pictures depict. I have cataloged these pictures from you for my own family. Thank you.